“You’ve made a mess, Sherlock. I’m here to fix it.” This was the dramatic proclamation by Morland Holmes that ended the last episode, “The Past is Parent.” The opening scene of “Evidence of Things Not Seen” is an immediate continuation of last week’s conclusion. Morland and Sherlock have moved from the roof to the kitchen, where a tense conversation ensues, and it appears that Holmes Sr. will make good on his promise. He offers, through some mysterious godlike power, to restore Sherlock and Joan as employees of the NYPD. This week’s episode evoked much the same feelings as last week. 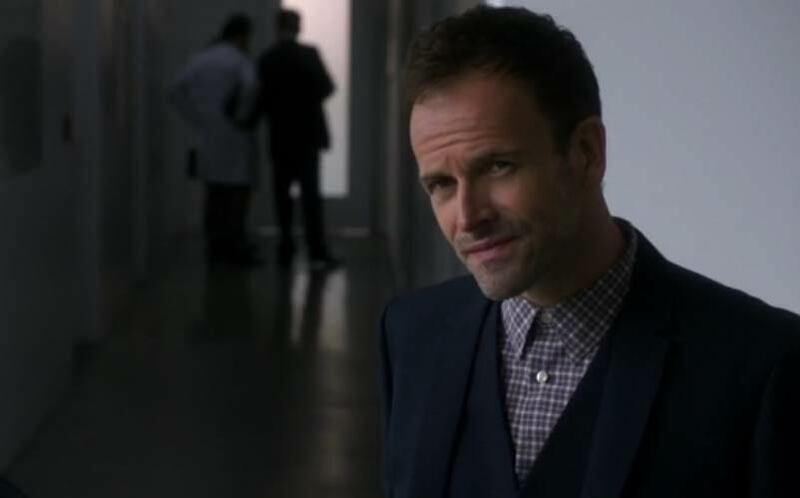 While entertaining and containing all the elements we have come to expect from Elementary, it was vaguely underwhelming and incredibly predictable. Overall, it was a solid episode, but distinctly lacking in certain areas. The events of the season three finale and this season’s premiere could easily have taken the show in a new direction, but instead it appears that things will soon return to normal at the brownstone. Or what passes for normal with Holmes and Watson, anyway. Joan has always seemed rather skeptical regarding Sherlock’s less-than-amicable feelings towards his father, but this week it seems that the two have a reversal of sorts. While Sherlock’s attitude towards Morland could be described as frosty at best, he softens throughout the episode, while Joan becomes increasingly suspicious. This suspicion culminates in a delightfully tense scene in which she confronts Morland like a true badass and displays her fierce protectiveness of Sherlock. You may be a billionaire, international businessman, and apparently have law enforcement in your pocket, but you don’t mess with Joan Watson. In an effort to remedy their unemployment situation, Joan secures the pair an audition of sorts with the FBI, consulting on a case in which a research team and their subject have been brutally murdered. The case, while interesting, was another area that was notably predictable. As per usual, Sherlock and Joan come up with a suspect that seems promising, but of course is not ultimately the killer. A characteristic series of twists brings several more likely suspects to light, before the mastermind is finally revealed, with Sherlock and Joan of course showing up the FBI at every turn. This begs the question: why did they deign to work with the NYPD all this time? They could clearly be working for the CIA by now, had they the ambition. The fatal flaw the producers made, of course, was offhandedly introducing a handicapped woman at the beginning of the show; I doubt anyone saw her and didn’t instantly realize she was the killer. Obviously they thought she was the person we would least suspect, but this had the effect of making us suspect her all the more. Really, how obtuse do they think we are? Sherlock and Joan fell into this trap, however, and not until the very end did it come to light that a woman with a crutch could have murdered four able-bodied people at close range. So, as was the case in the last episode, the audience solved the mystery long before the consulting detectives did. And, of course, Sherlock’s casual mention of the dead rat at the onset of the investigation turned out to be the solution for the whole case. They weren’t fooling us into thinking that detail was superfluous. Sherlock’s ultimate decision to take Morland up on his offer and go back to the NYPD, despite his warning to Joan that no favor from his father comes without a price, is unsurprising. The goodbyes to Detectives Gregson and Bell in the last episode had a hollow, nonpermanent feel. And the FBI agent the pair works with in this episode is not only dreadfully incompetent, but has a distinct lack of personality that makes him unlikely to become a prominent character. Although they fell into their new role with ease and patently outperformed the federal agents, it seems they will return to their cushy gig with New York’s finest. We still see disappointingly little of John Noble, but what we do see is spectacular. He manages to appear both cold and calculating and warmly paternal as the situation demands. Morland does mention that he is unable to stay in New York for long; so, like Mycroft, his appearance may unfortunately be transient. At least his mysterious business is finally explained, and he is no longer an anonymous billionaire (à la Charlie Townsend). We would love for him to become a permanent fixture on the show, so if he is not staying in New York, perhaps he will pop in from time to time to check on Sherlock. It seems unlikely that producers would hire someone like Noble for brief appearances in a couple episodes. Conspicuously absent to this point in the series is any mention whatsoever of Sherlock’s mother. The only thing this episode left us wondering is when the show will finally acknowledge the other half of Sherlock’s parentage.